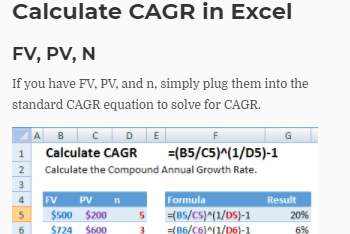 Macros in Excel are stored as VBA code, and sometimes you’ll want to edit this code directly. This tutorial will cover how to view and edit macros, describe some macro debugging techniques, and give some common editing examples. 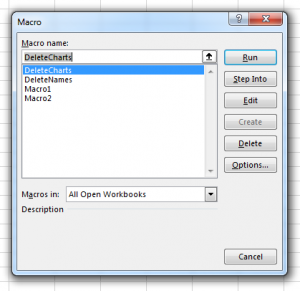 A list of macros can be shown in the Macros dialog. To view this dialog, select the Developer tab on the ribbon and click the Macros button. 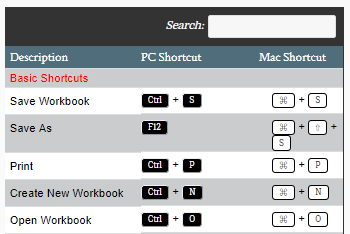 If multiple workbooks are open, macros from all workbooks will be shown in the list. 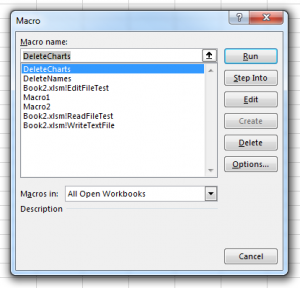 Macros in the active workbook will appear by name alone, while macros in other workbooks will be prefixed by the workbook name and an exclamation point (i.e. “Book2!OtherMacro”). 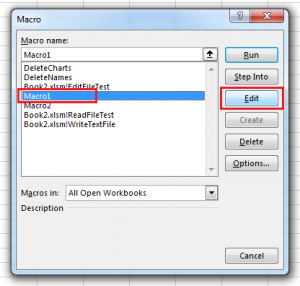 You can use the Macro dialog to open the code for a macro by selecting the macro’s name and clicking the Edit button. 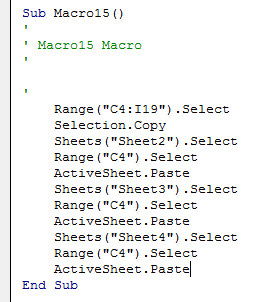 This will open the macro in the VB Editor. 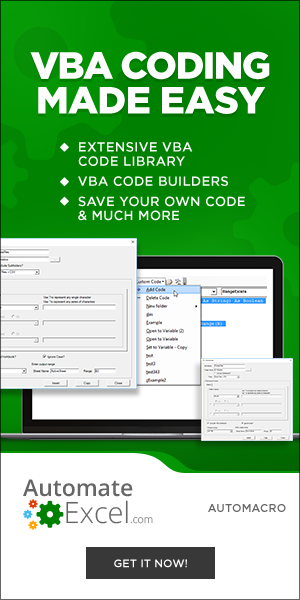 Alternatively, you can open the VB Editor directly by clicking the Visual Basic button on the Developer tab, or by pressing the ALT+F11 keyboard shortcut. 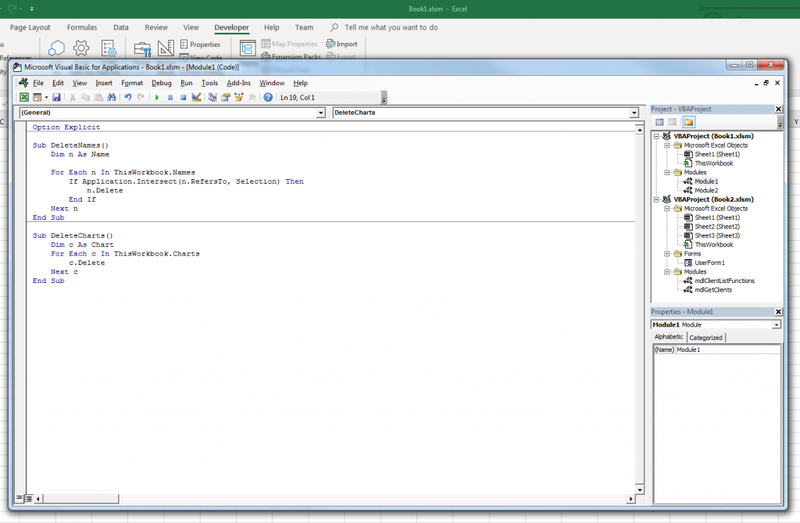 The VB Editor has several windows; in this tutorial we’ll cover the Project Window, the Properties window, and the Code Window. 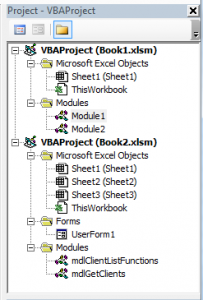 The Properties Window shows the properties and associated values of an object – for example, clicking on a worksheet object in the Project Window will show a list of properties for the worksheet. Property names are on the left, and property values are on the right. 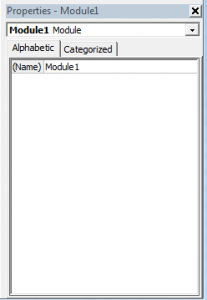 Selecting a module in the Project window will show it has only one property, “(Name)”. 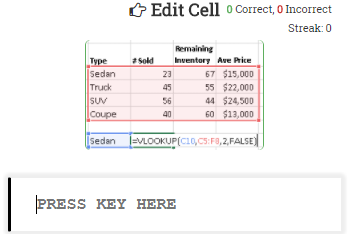 You can change the name of a module by double-clicking the property’s value, typing a new name, and pressing Enter. Changing a module’s name will rename it in the Project Window, which is useful if you have a lot of modules. 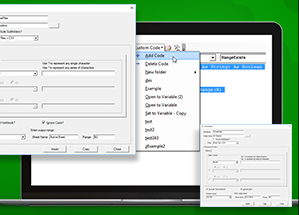 Code windows are special text editors in which you can edit your macro’s VBA code. If you wanted to see the code for a macro located in Module1, you would double-click ‘Module1’ in the Project Window. 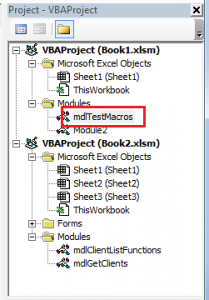 Macros can be run directly from the VB Editor, which is useful for testing and debugging. 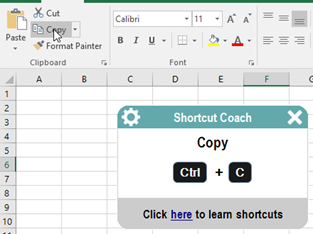 Instead of running the macro all-at-once, you can run the macro one line at a time, using a keyboard shortcut to “step through” the code. 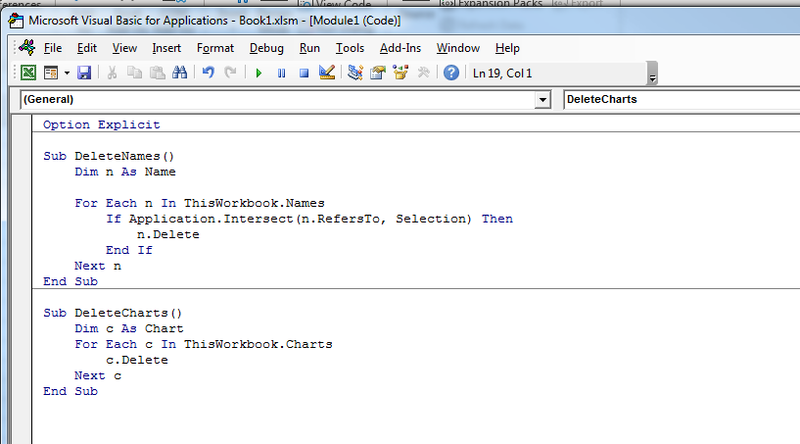 The macro will pause on each line, allowing you to ensure that each line of code does what you expect in Excel. 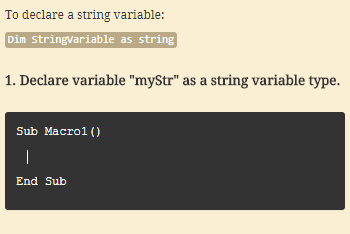 You can also stop a macro from continuing at any time using this method. The macro recorder – while effective – is also very limited. In some cases it produces slow macros, records actions you didn’t intend to repeat, or records things you didn’t think you were doing. Learning to edit your macros will help them run faster, more efficiently, and more predictably. Besides fixing those issues, you’ll also gain a massive increase in productivity when you harness the full power of macros. Macros don’t just have to be recordings of tasks – macros can include logic so they only perform tasks under certain conditions. In just a couple of minutes you can code loops that repeat a task hundreds or thousands of times in one go! 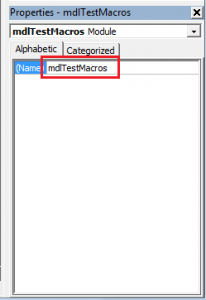 Below, you’ll find some handy tips to help optimize your macro code, as well as tools to make your macros work harder and smarter. If you’ve got a macro that takes a long time to run, there may be a couple of reasons why it’s running slowly. The line “Application.ScreenUpdating = False” means you won’t see the macro working, but it’ll run much faster. 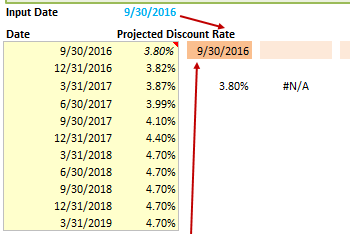 Note that you should always set ScreenUpdating to True at the end of your macro, or else Excel might not act the way you expect later! 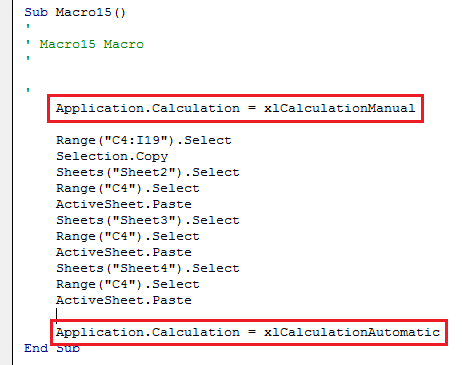 The macro recorder saves all your actions as code in a language called VBA. 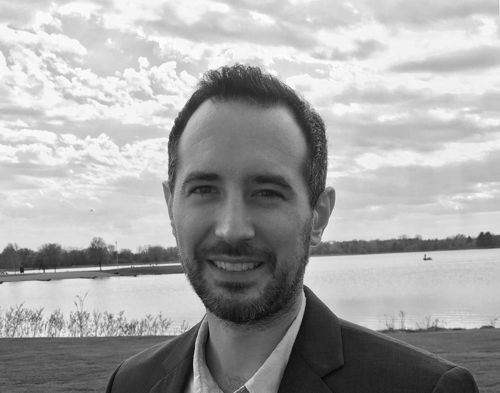 VBA is more than just a way of recording actions in Excel – it’s a programming language, which means it can contain code to make decisions about what actions to perform, or repeat actions until a condition is met. 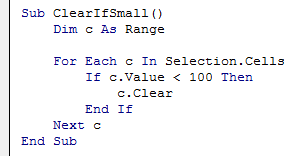 In this example, we use a For loop, which is a kind of loop that iterates through a range of items. Here, our range is the numbers 1 through 19, using a variable named ‘i’ so the loop can keep track. Inside our loop, there’s only one action being repeated between the for and next lines (the sheet adding), but you can add as much code inside the loop as you want to do things like format the sheet, or copy and paste data to each sheet – whatever you want to repeat. 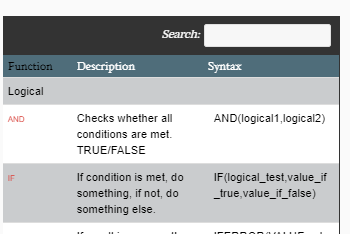 This simple example shows how the If statement works – you test some condition that is either True or False (is the value of the selected cell less than 100? ), and if the test returns True, the code inside runs. In this example, there’s a slightly different For loop – this one doesn’t loop through a range of numbers, but instead loops through all the cells in the selection, using a variable named ‘c’ to keep track. 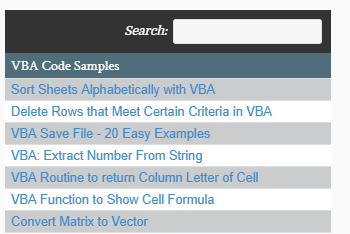 Inside the loop, the value of ‘c’ is used to determine if the cell should be cleared or not. Loops and If statements can be combined any way you like – you can put loops inside loops, or one If inside another, or use an If to decide if a loop should run at all. 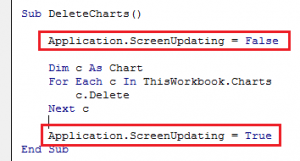 A common reason to edit macro code is to remove screen scrolling. When recording a macro, you may have to reach other areas of a worksheet by scrolling, but macros don’t need to scroll to access data. This kind of code is completely unnecessary and could be deleted without affecting any other functionality. 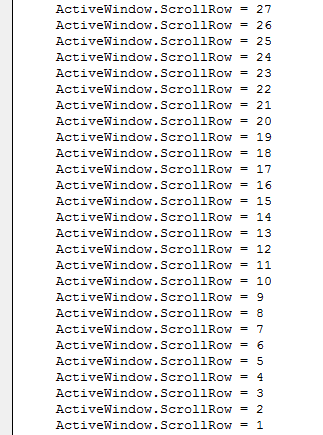 Even if you wanted to retain the scrolling, this code could still be condensed into a loop. Even though only the font name was changed, eleven (11) font changes were recorded like the font size, the text effects, etc. 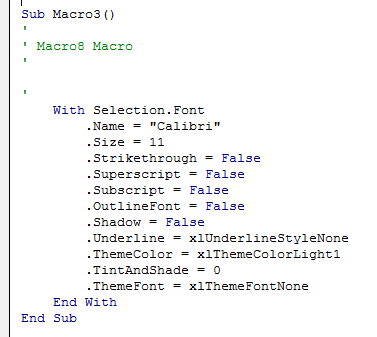 If the intent of the macro was to only change the font name (while leaving all other properties alone) this recorded macro wouldn’t work! Not only will this macro work as intended now, but it’s also much easier to read. 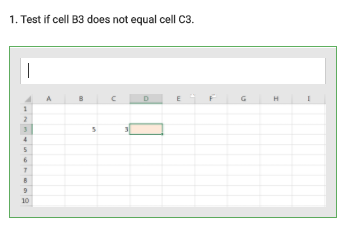 Another thing that gets recorded in macros are worksheet and cell selections. This is a problem because a user can easily lose track of what they were just working on if the cursor moves to a different position after a macro runs. Whenever code becomes full of references to “.Select” and “Selection”, it’s a clue that there’s room to optimize that code and make it more efficient.